I am always on the hunt for new and exciting allergy~friendly treats for my kids, especially during the holiday season. I have a suggestion which I think will please many of you managing the same challenges in your home. 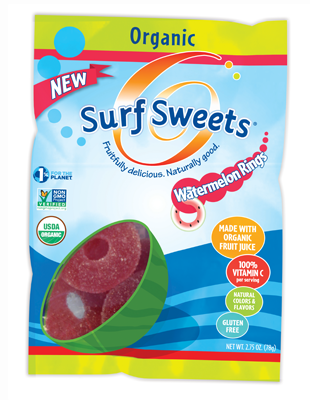 Surf Sweets, manufactured by TruSweets, LLC. 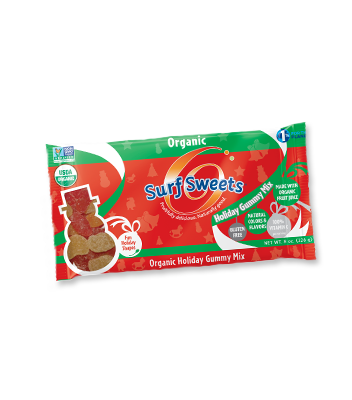 These candies are made in a NUT-FREE FACILITY and are guaranteed to be made with USDA certified Organic fruit juice and are corn-syrup free, GMO free AND gluten-free. 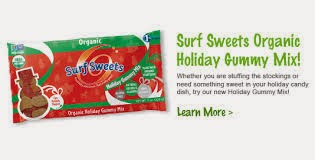 You will also find that the majority of their products such as the Organic Holiday Gummy Mix, Watermelon Rings, Fruity Bears, Sour Worms and Fruity Hearts are certified to be FREE of the TOP 10 ALLERGENS. Tell me these candies made with all natural, pure ingredients wouldn't be a HUGE SCORE for your 'stockings hung by the mantle' or 'candy dishes filled with sweet joy'! As a parent, I think it's just another plus knowing that each package provides our kids with 100% of their daily Vitamin C.
They taste great and my kids LOVE them. And I LOVE that they are SAFE for them! A Few of Surf Sweets Options from S.A.F.E. Still interested in learning more? Be sure to visit their Surf Sweets Product Page, Naturally Good Page and their Where To Buy Page . You may be pleasantly surprised to find you can locate them locally. And if not, NO WORRIES! It's not too late to purchase them on-line! I love Surf Sweets candies! So grateful for the vendors who provide allergy-friendly foods!